A link between viral infection, disruption of DNA damage response (DDR) pathways and cellular transformation/tumorigenesis has been established for a variety of oncogenic human DNA viruses. In addition to the direct effects of transforming viral oncoproteins, infection can also indirectly affect tumor suppression and alter epigenetic regulators of cellular function. Perturbations or alterations in the DDR pathway can result in DNA mutations and genetic instability, hallmarks of cancer. 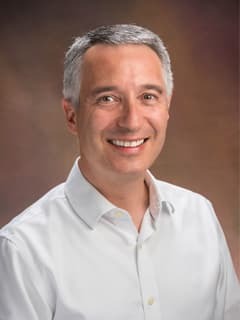 Matthew D. Weitzman, PhD, and a team of researchers at the Center for Childhood Cancer Research, are studying how viral proteins manipulate cellular pathways. Deciphering ways that viruses alter cellular functions, and identifying their cellular targets, have provided insights into fundamental cellular processes. The Weitzman Laboratory has developed sophisticated proteomic approaches to identify the cellular proteins that respond to foreign viral DNA genomes, as well as the host factors exploited by viral manipulators. Viruses produce proteins that often seek out key cellular regulators. The lab is employing proteomic approaches to identify the substrates for viral ubiquitin ligases that demolish intrinsic host defenses. For example, they demonstrated that the herpes simplex virus 1 (HSV-1) viral ICP0 ubiquitin ligase targets host DNA damage proteins RNF8 and RNF168 to control histone ubiquitination and DNA damage responses. Other studies with adenovirus infected human cells revealed that the Mre11-Rad50-Nbs1 (MRN) complex is a key sensor of DNA damage and also responds to viral genomes delivered into the nucleus of infected cells. Additional studies are underway to define intrinsic host defenses that are manipulated by viruses and point to important cellular guardians of genome integrity.